Being stuck in traffic for an undetermined amount of time has become a way of life for Dhaka's commuters. Some people take it in their stride and even try to make the best of an impossibly bad situation. Many people have said that they take the time to read the newspaper, a gripping novel or even continue work in their laptops. Others like to snooze and even have the pleasure of a few dreams to entertain their subconscious. For people who hardly have the time to listen to music, a traffic jam gives them that enforced free time to listen to favourites on their i pods or cell phones. I, like to watch people. I try to scrutinise their faces to determine whether they are happy, sad, worried, irritated, lost... It is a rare opportunity to observe people without them knowing that they are being watched. I know it is an invasion of privacy but it is too irresistible to refrain from. Sometimes as I trudge along with the rest of the traffic I see things that give me that warm, fuzzy feeling inside, that makes me feel hopeful that the world isn't such a bleak place after all. I see a grandfather and grandchild walking along the streets of busy Farmgate, the little boy is carrying a big bag while his grandfather, carrying another bag, follows behind slowly, trying in vain, to catch up. They must go up the steps of the footbridge and the little boy is already halfway there when he stops and turns around. The grandfather is panting, worriedly looking at the prospect of climbing so many steps. The boy, slightly abashed at his lack of sensitivity, runs down quickly, takes the other bag and then goes up slowly, keeping pace with his grandfather. Going by Airport Road I see a couple, they look like garment workers on a badly needed break. The young man is pleading with the young woman, she is upset, there are tears in her eyes as she brushes away her paramour's hand. He is crestfallen and then just as one would think she is about to walk away she veers towards him and looks at him with that typical expression a young woman in love has just as she is about to forgive. I let out a sigh of relief, more so because the traffic is moving and I was getting a stiff neck trying to see the end of the lovers' spat. Some scenes, however, are ones that you would rather not have seen; the delay just forces you to witness the harsh reality that you are always trying to avoid: There are slums everywhere. If you take a short cut through the Tejgaon road to go to Karwan Bazar it is impossible not to see the desolate images of the polythene covered shacks along the roads. A dusty child with hunger and despair in his eyes sits in one of those little makeshift huts; he is ill and whining, his mother hands him a dirty bowl with just a handful of rice which he eats listlessly. The scene is repeated again and again as we move on, grey faces lined with hopelessness and everlasting hunger. I want to look away but cannot and find myself staring straight into the eyes of a woman who stares blankly and she is the one who looks away, leaving me mortified by my existence. Under the Farmgate footbridge I see young men sitting in a stupor from some kind of intoxicant. One of them seems to be sleeping, bare bodied, his hair all tangled up and grimy, holes in his trousers. Is it heroin or that substance called 'Dandy' that they inhale to forget the past, present and future? In another instance, well after iftar, I am again stuck in the sea of vehicles. Men have the temerity to ogle even while they are trying hard to breath in the buses that are packed like sardine tins. The traffic has slowed down almost to a halt and I crane my neck to see whether it is because of some VIP for whom the roads are being blocked. Instead, I am amazed at the scene ahead. 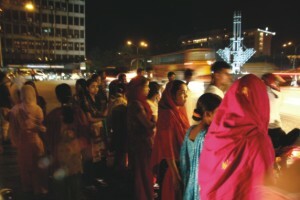 A group of about fifty or so people - men, women, young, middle-aged and old, are walking quietly along the Kazi Nazrul Avenue. The silent procession seems to be led by an old man with a flowing grey beard and longish grey hair. He is a sadhu of some sort and I watch him hand over a bottle of water to one of his disciples. The traffic patiently follows this strange procession without any protesting honk or jarring expletive. It is after all a holy month and a time to exercise tolerance. The mystical man and his followers turn left to Bijoy Sarani and we, the onlookers resume our clamorous journey home.